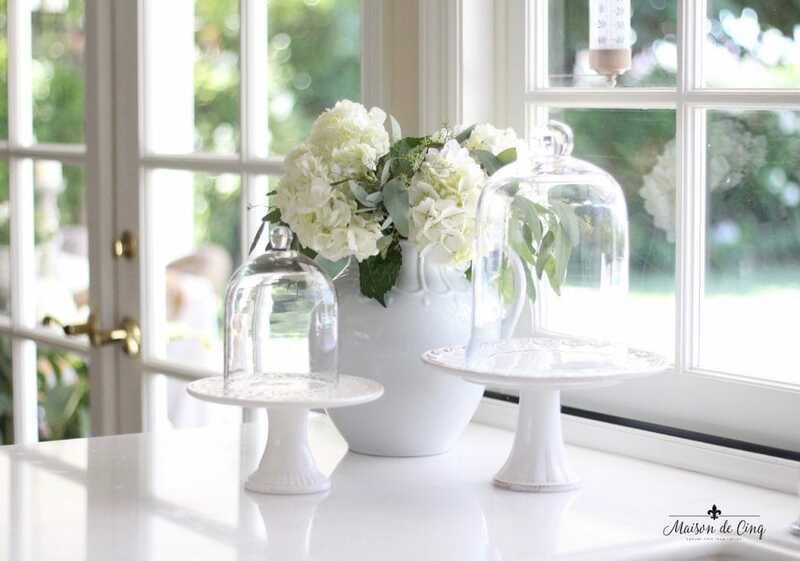 Decorating with Flowers - Tips and Tricks for Success! Hi there and Happy Friday! Every month I get together with a group of bloggers to do a monthly blog hop. Well, this month we’ve decided to talk flowers! 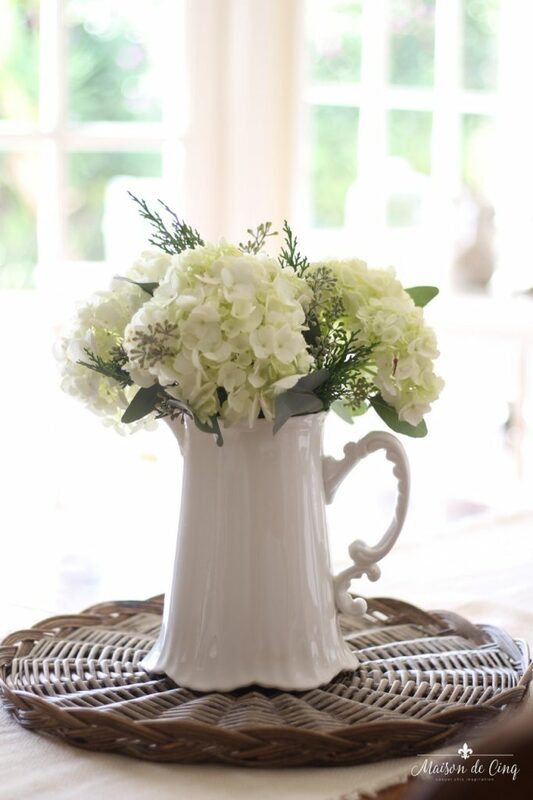 Flowers are in abundance this time of year, so we thought it would be fun to focus on decorating with flowers. And who doesn’t love doing that?! If you’ve been here before, you know that flowers are a big part of my decor. This is one of the most obvious places to start decorating with flowers – at least for me. My kitchen is where I spend the most time, and it’s also where we entertain (everyone always gathers there!) so it seems natural to have fresh flowers there. 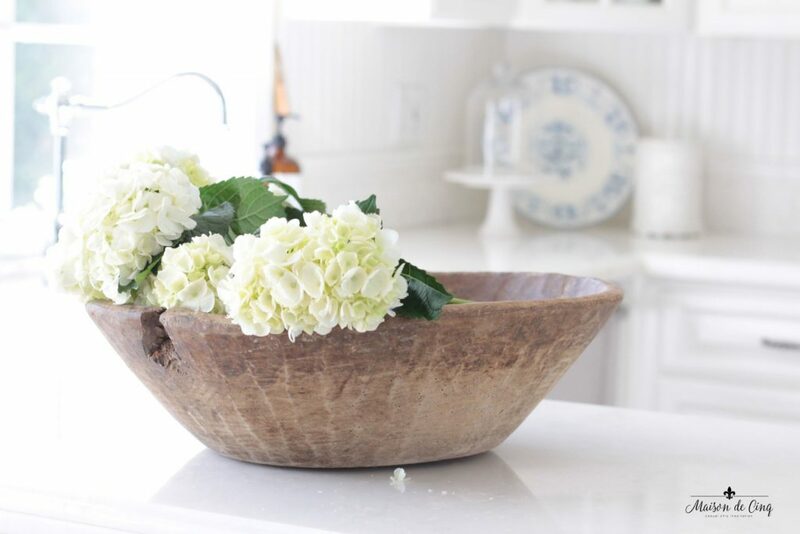 Here I used white hydrangeas – my favorite and one you will see a lot of in this post! This is also the biggest area on my counter, and an out of the way area so it’s a natural corner for decorating. This decor was for early spring so I mixed some spring-y colors, green and pink, with white. And I love to create little vignettes in this corner. 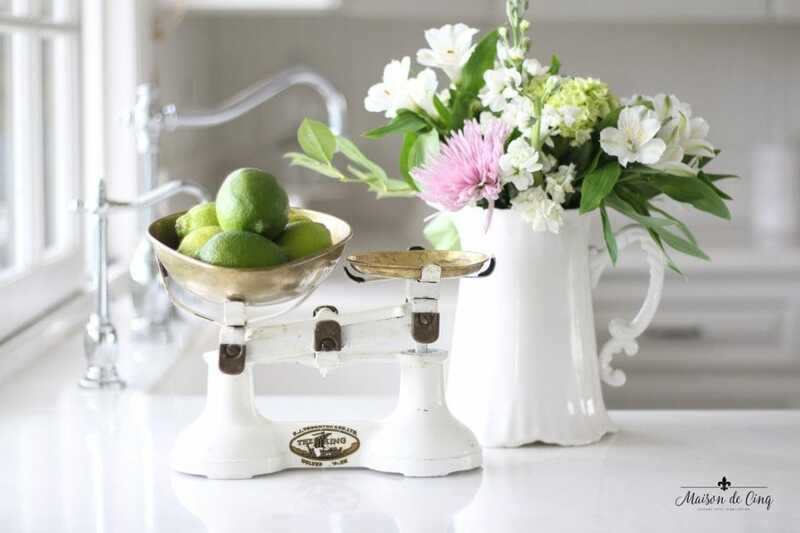 This time I used a white vintage scale holding limes and combined that with the white ironstone. This was a little different. I wanted to use my dough bowl, but obviously, you can’t stand flowers up in it! So I soaked a floral sponge with water and then set that inside a shallow bowl inside the larger bowl. They stayed fresh in this for several days! I loved the look and will definitely do it again. 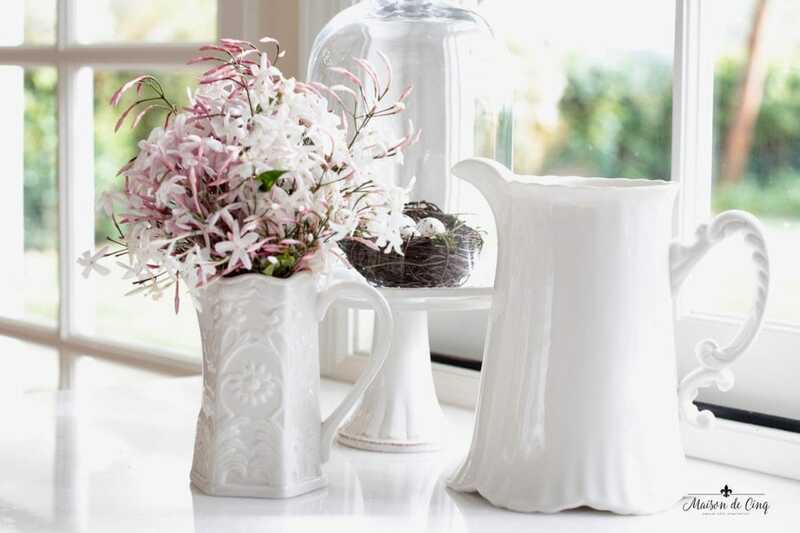 Here, rather than buying flowers, I just brought in some jasmine from the yard and filled a little pitcher. Love the scent garden flowers bring in! They’re always more fragrant than store-bought! 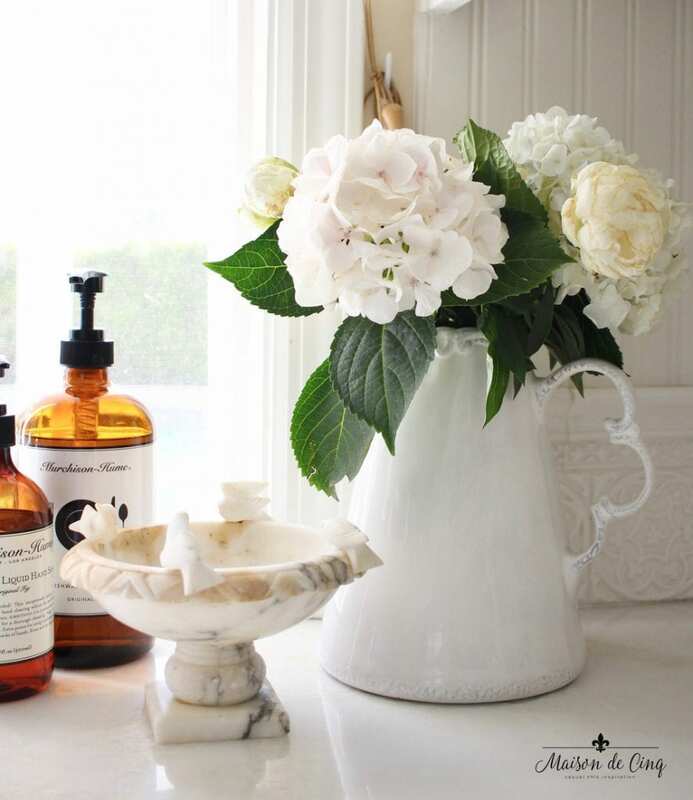 Here I put flowers next to the sink, a look I also love! Peonies and hydrangeas together create a little diversity rather than using either one alone. And just so you don’t think I only use white flowers, here is proof! 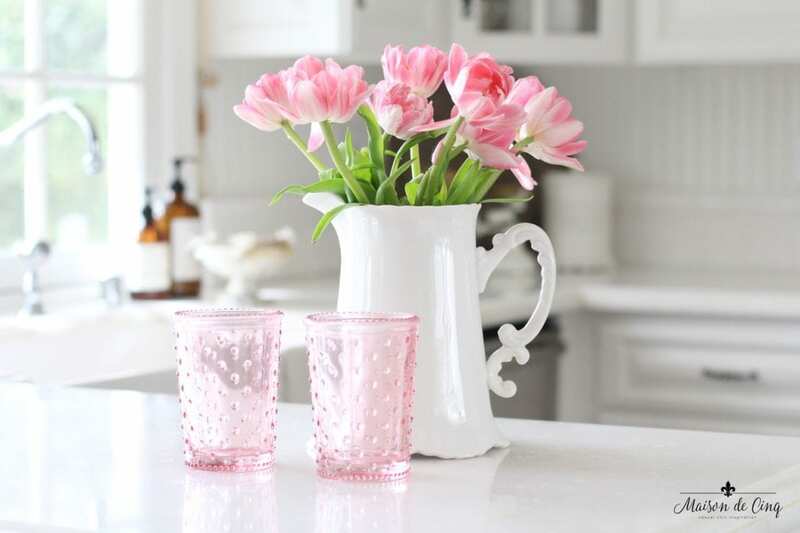 Pink tulips brighten up the kitchen counter on a dreary winter day. 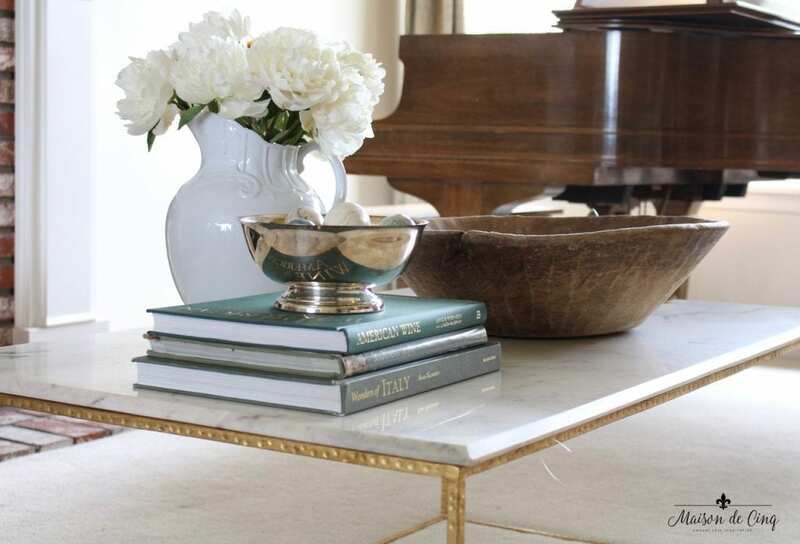 Another place I love to decorate with flowers is on the coffee table. This is something I was not able to do until recently, as I’ve always had a cat which meant they were usually chewed and thrown up somewhere! Now I love to display them on various tables in both the family and living rooms. 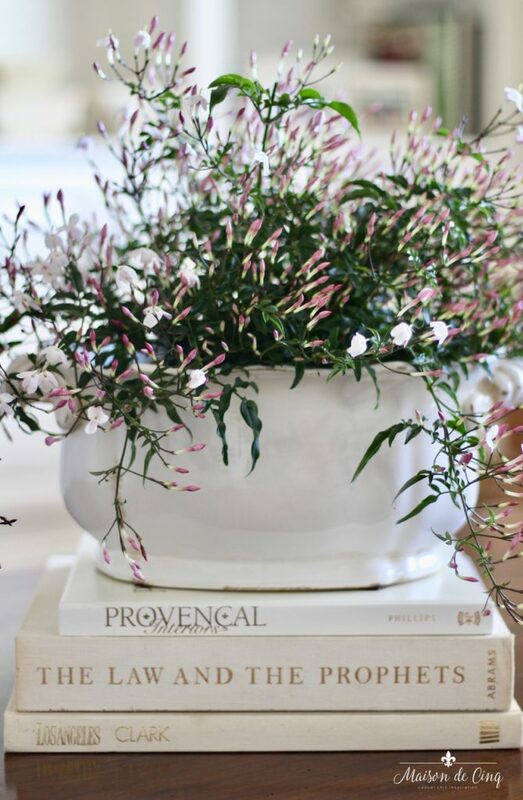 Jasmine is a wonderful flowering plant available at markets for a short period in early Spring. I love to bring it indoors because the fragrance is so intoxicating! Probably my all-time favorite flower is peonies! Here in California they are only available for a very short window, so I buy them as much as I can while they are here. These hydrangeas were from my garden, and since they were not going to last much longer on the plant, by cutting them and bringing them inside it actually extended their life a while longer. And brought some joy inside! This is another place where you can make an impact by decorating with flowers. Instead of having a display of a vase, urn or something else, I sometimes switch that out for fresh flowers, especially during any holiday season. 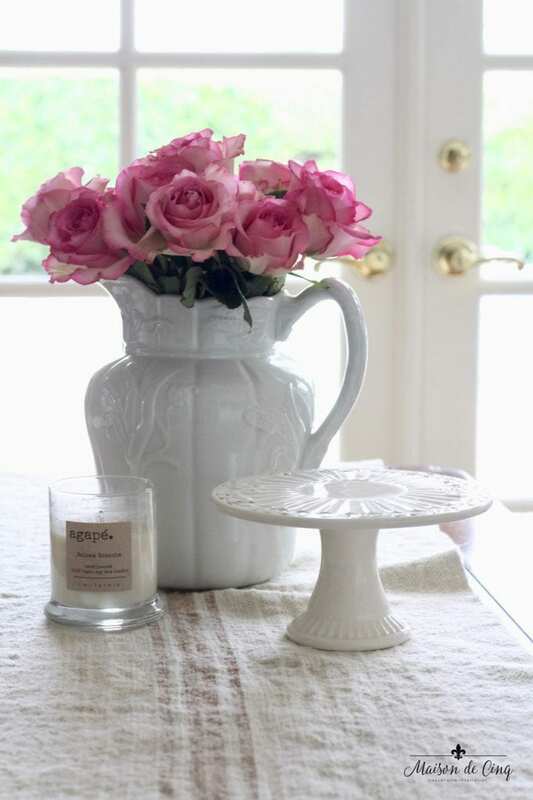 Or, I’ll combine the flowers with some other items on the table to create a vignette. 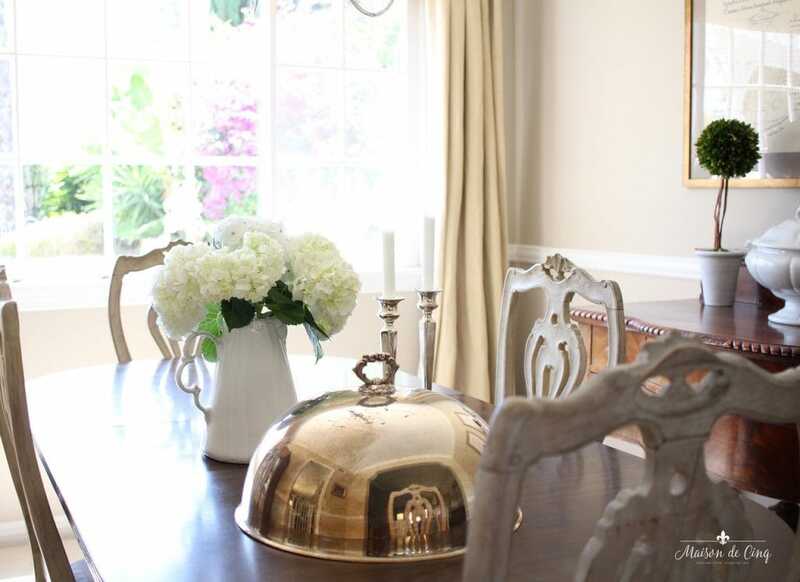 A casual vignette on the dining table adds some cheer to the space. 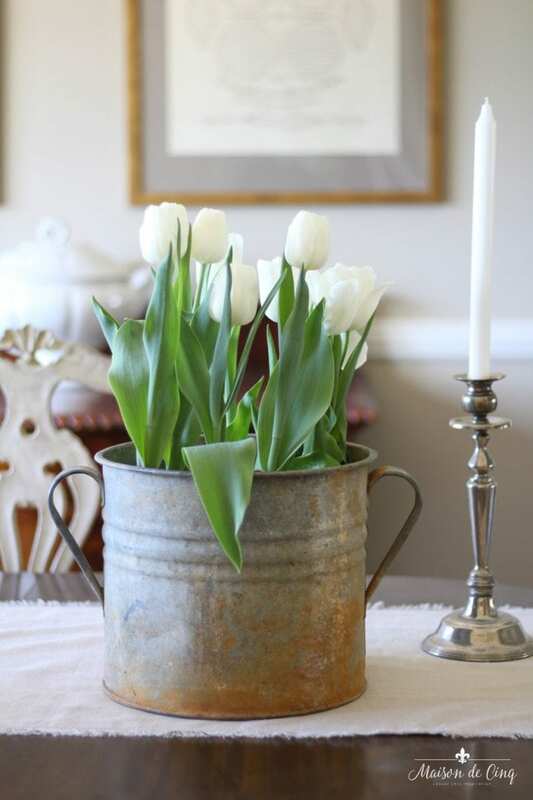 I love the mix of this crusty vintage bucket with the white tulips. This was part of my Spring Tour this year and one of my favorites. Although I usually gravitate to white flowers, these pink roses were so pretty, I couldn’t resist! Sometimes I plant flowering plants in a container, rather than using cut flowers. The obvious advantage that they often last much longer! Another vignette sits on the table in our breakfast area. I hope this gave you some ideas of how to use flowers in your own decorating. 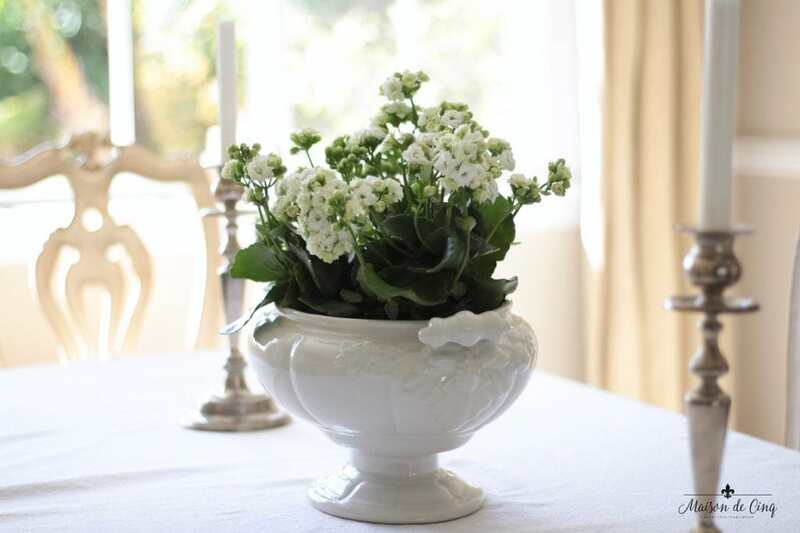 Whether you spring for a bunch at the grocery store, spend more at a florist, or simply snip some from your yard, it adds so much beauty to a room. I truly can’t think of another item that brings so much joy for so little investment! To see all my best styling tips for flowers, as well as ideas on how to buy them and stay in budget, check out my post all about them! 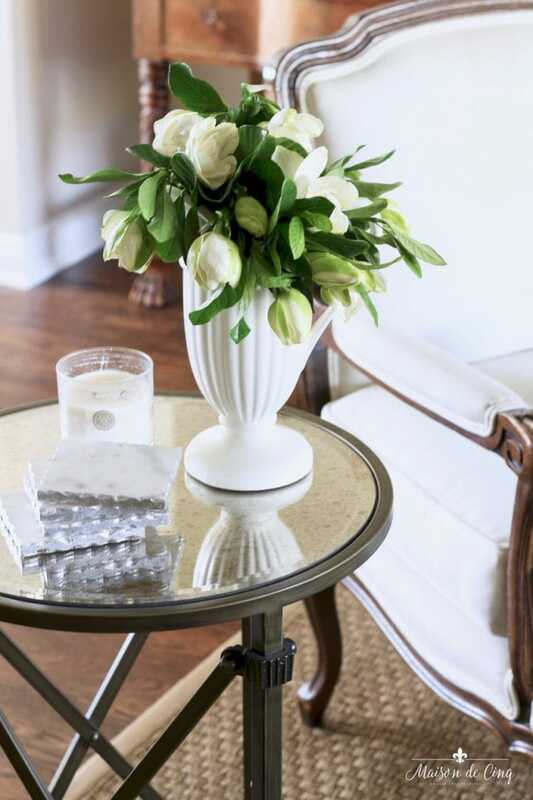 How to Decorate with Flowers: 7 Easy & Stylish Tips! I just brought limelights in the house. I posted about them. The blooms are enormous this year. Oh Limelights are so wonderful! How lucky you are to grow them. I’ve only grown other whites here but I’d like to try limelights next spring – I love how big they get!! Thank you so much for stopping by – and happy weekend! Amazing blog! I love to read your blog because they are interesting as well as useful for all . You have my heart with the white flowers Sheila! I also love that you did a little pink! So pretty! Sheila I love how you arrange flowers around your beautiful home! I love Trader Joe for flowers too! Your hydrangeas from your garden are beautiful! 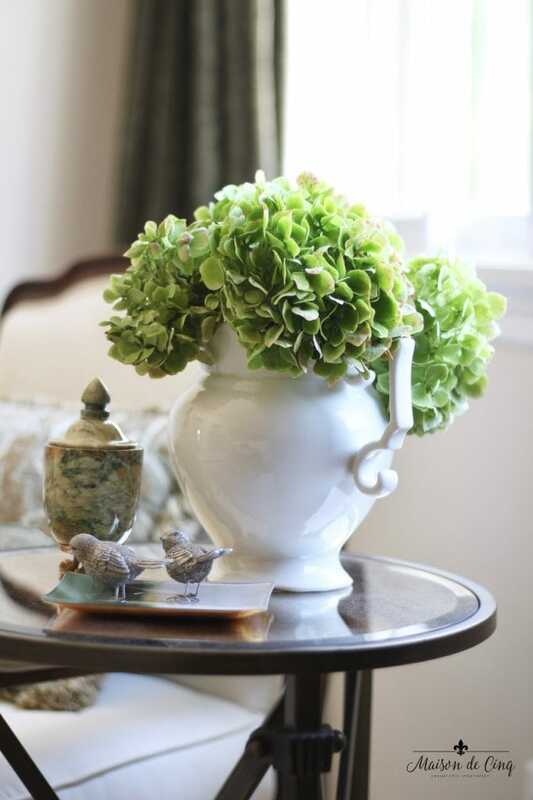 I like hydrangeas too(my go to flower)and always have some in my home. Gorgeous post! You’re a woman after my own heart Joan – hydrangeas are my favorite for sure! Isn’t Trader Joe’s the best?! I never used to have fresh flowers because of the expense, but now I can’t imagine not having them all the time! And hydrangeas and peonies are my favorites too, I just hate that the peonies are only here for a minute! You are so lucky you’re able to grow them. I’m dependent on the luck of finding them at Trader Joe’s for the two days a year they’re here, ha ha! I’ve so enjoyed getting to know you and love our monthly blog hops! Happy Easter! Your vignettes are always so classic and beautiful, Sheila! And adding flowers to them just makes them even more gorgeous! Thank you Kathleen! You are so sweet! Loved your flowers with the limes so much, and as always, love hopping with you my friend!